friend once “punked” me by yanking on my fly line. It was a crisp February morning just before dawn, and we were tossing searching casts for striped bass on Georgia’s Lake Lanier. When my buddy grabbed my line, he meant to shock me into thinking I had a bite. But back then I’d never felt a mature striper hammering a fly, so I didn’t get the joke. I was used to trout and carp bites where you simply feel the line come tight. Now I know: Stripers are different; they hammer a fly. Luckily striped bass are abundant, and the chance to catch one is never far away—especially in the South, which I call New Striper Nation. In fact, thanks to aggressive stocking efforts in the 1960s and ’70s, stripers—Atlantic and Gulf Coast natives—are now found in lakes throughout the country. In some of these lakes and impoundments stripers can be tough to find, but during summer inland stripers go semi-nomadic, chasing baitfish while seeking thermal refuge in the rivers above these deep impoundments. The Chattahoochee River system in Georgia, the Tallapoosa River in Alabama, the Cumberland River in Tennessee, even the massive Arkansas River system near Little Rock and in eastern Oklahoma—these waterways merely scratch the surface in terms of the widespread availability of striped bass. 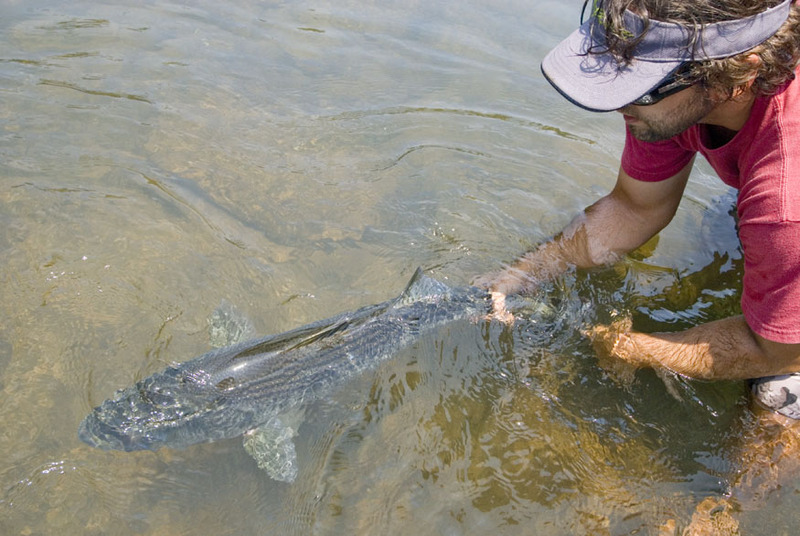 Of course, the idea of catching stripers on a fly is intimidating, especially for greenhorns. The waters these fish frequent look completely different from the trout streams you may be familiar with. They are deeper and wider and often have powerboats on them. The tackle required to subdue these fish is heavy: 8- to 10-weight rods with matching sinking lines (I favor integrated shooting-head systems). The flies that tempt these fish are comparatively massive—sometimes as large as the trout sought in smaller rivers. Fundamentally, though, I believe the biggest hurdle in fly-fishing for inland stripers is cultural. Stripers are considered conventional-tackle territory. In fact, most bait guys tell you that stripers can’t be caught on a fly. And for far too long we’ve been too fast in accepting that suggestion. Master Yoda would have made a good striper fisherman, because one must do or do not. There is no try. But that is changing. 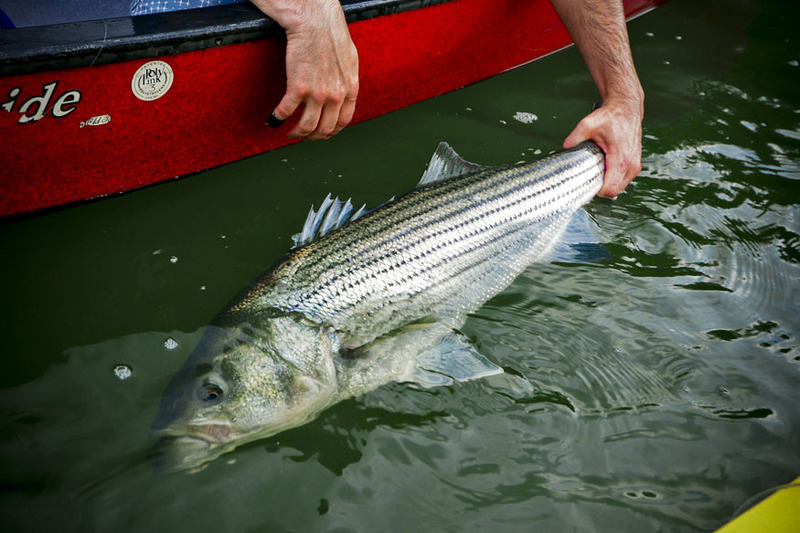 Fly shops in areas away from classic trout waters are now actively touting their fisheries as striped-bass meccas, and they are elevating inland stripers to prime targets. Anglers visiting places like Cohutta Fishing Company, in northwest Georgia, or McLellan’s Fly Shop, in Fayetteville, Arkansas, can now plug into the striped-bass mindset. Basically, during the past 10 years a striper-fishing culture—in fact, a fly-fishing culture—has arisen. Take Garner Reid, for example. He is a young Southern guide who specializes in the comparatively narrow, timber-strewn waters of the Etowah River, a tailwater that laps at the base of prehistoric Indian pyramids near Cartersville, Georgia. I once attended a bonfire party under a harvest moon across the river from this primary pyramid complex. In the thin October air, with sparks rising to greet the stars, it was easy to picture the days when the Etowah Indians—an ancestral tribe of the Cherokee—sought native river-running stripers with their basket-woven nets and V-shaped rockfish traps. They likely targeted the same summertime striper runs we do today, although our Gulf-strain stripers are now penned behind tall dams and no longer have free run of the river all the way to Mobile. Stripers of this size range rivers throughout the South. Reid floats the Etowah like a Western trout guide would headhunt for trophy browns on his or her day off. He rows a skiff—a low-slung, square-fronted boat perfect for lower-gradient Eastern waters but capable of handling moderately fast runs. Reid’s anglers—and this is common practice throughout the striper-fishing South—search the water with long casts and swimming flies on sinking lines. 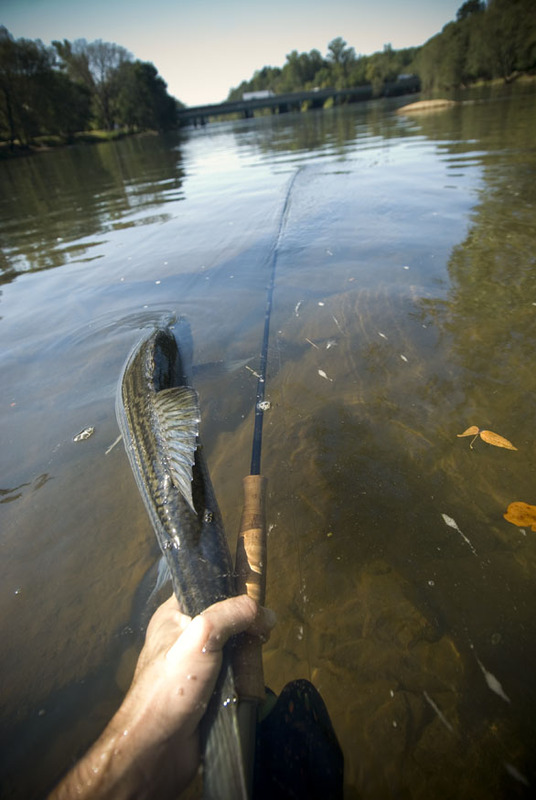 Imparting action to these flies can be important; for example, Pole Dancers and Wiggle Minnows imitate a Rapala-style swim bait, and both catch striped bass. Although striper fishing varies from year to year based on the strength of the run, Reid’s anglers are posting success rates that are nothing to sneeze at: double-digit numbers of double-digit-size fish in a single day. Although that experience existed 10 years ago, it was something guides kept to themselves. Fly-fishing for stripers has developed in lockstep with what might be termed the current “youth movement,” especially in the South. Closely allied to the new wave of fly-fishing films—which themselves are heavily influenced by snowboard culture—this small slice of angling culture is a lot more likely to feature tattoos, beards, retro clothing and trucker hats than neoprene waders and multi-pocketed fly vests. Many—possibility the majority—of these anglers are in their 20s. They grew up in fly-fishing during a period when conventional ideas—for example, flies tied with only natural materials and the superiority of the dry fly to all others—had begun to fade. Consequently, these anglers are almost entirely free of received wisdom; they favor whatever works as opposed to doing things how they should be done. Of course, things that work quickly become “things that should be done,” and the surge of creativity spawned from this movement directly contributes to rising angler success rates across the board. Fly fishers floating rivers throughout the South no longer hope to catch a striper; they now expect to nail one . . . or more. For trout anglers considering the striper game, it’s important to note that stripers utilize rivers differently than trout do. Trout anglers search around structure, such as submerged rocks or in fast riffles that provide the oxygen trout need to survive. Many new striper anglers automatically throw flies to those locations and come off the water disappointed. Remember: Stripers are heartier than trout. They don’t require a fast flow to feed them enough dissolved oxygen to breath. In addition they are ambush predators to a greater extent than all but the largest trout, which means they are just as likely to lurk in the slow water, patrolling the cushion on the front edge of a long horizontal shelf, as they are to be in the swift foam. When the water is clear, you sometimes can watch a prowling river striper establish a pattern as it seeks wayward baitfish. Other trout fishing tactics also can be shelved. For example, wade fishing for stripers is technically possible but rarely productive. While the fish can establish predictable holding lies over the course of a summer, they tend to remain schooled up until the tail end of their summertime run (usually in August), when solo fish finally break off from the group. However, during most of the summer window, when these fish are available in rivers, they will be in packs. Catch one and you generally can catch several in the same spot (provided you rest the water between fish). For a wade angler, this may mean a lucky day of hot action when the school happens to pick an accessible spot, but the tradeoff will be many more days of striking out. Floating is the best tactic for these fish, because it allows you to cover the widest possible range of water. The armada anglers use to chase stripers is almost total. I’ve landed stripers from a one-man pontoon boat, from a canoe, from kayaks and stand-up paddleboards, and from drift boats and larger jetboats that you would expect to see in Alaska. The only real criteria for a striper boat is that it allows anglers to stand up. Standing is critical, because you have to throw long, searching casts for these fish, and an elevated stance allows a lengthy backcast. In addition you need to be stealthy, and standing allows you to spot fish from a distance. I have observed striper anglers of various skill levels, and that has given me a lot of time to consider what separates the bad from the merely good from the legitimately great. Legitimately great striper anglers make long, clean casts that turn flies over instead of allowing them to crash onto the surface. They land flies extremely close to bank structure but avoid getting tangled. They do not skip flies into likely holding lies, because the fish often stage a few feet off of structure—and the actual skip may land directly on a striper’s head and spook it. In addition these anglers rarely throw tailing loops, which tangle and force them to take a break from fishing. Instead, the most productive anglers understand their maximum casting range and try to stay within it. They manage their boats quietly and sneak into position, and they consider an exit strategy before hooking a fish. They keep their focus throughout the day. Make your first cast your best cast.Stripers are aggressive but equally wary. Invariably, your first cast into a likely lie has the greatest probability of producing a fish. Many new striper anglers fail to grasp this concept. They flog the water with a close cast, then a more distant cast, and then a full chuck-and-duck heave to their maximum range. Act like you’re hunting. Inefficient anglers bang their paddles against the sides of boats or allow boat lockers to slam shut. Stripers are big-game animals, and you can’t shuck and jive and bang your way up to them. Stealth is high priority. Be persistent. Even good anglers often fail at this. Most begin the day making heroic efforts, placing flies in every likely lie. Then about lunchtime they flag, taking extended breaks to drink beer and socialize or make less-focused casts in the general direction of fish rather than where the fish are. Master Yoda would have made a good striper fisherman, because one must do or do not. There is no try. This third rule—the least tangible of all—is the biggest difference between good anglers and the legitimately great. Sometimes you have to will a fish to bite. If any of this tech talk intimidates you, don’t let it. Deep-down stripers are eating machines, and in large swaths of the South they have become primary fly-rod targets. In my mind stripers are worthy of that attention. And now is a great time to tackle the learning curve, especially with a new angling tribe to share tactics and success stories with. But before you get on board, do yourself a favor and pick up a trucker hat on the way out the door. Street cred goes a long way down here. This article originally ran in the Summer 2016 issue of Fly Rod & Reel magazine. 3 Responses to "New Striper Nation"
Nice article Zach! I know you mention go big or go home… But I don’t want people to think that they have to throw a big fly to catch a big fish. Some of my best stripers have come on flies between 2-3 inches. Hey Zach. Could you help me by recommending your preferred sink tip fly line for striper? (I fish hooch around west point) Thanks for any help! My favorite line for striper fishing generally is the Scientific Anglers Sonar Sink Clear Tip (also known in its past iteration as the Mastery Streamer Express Clear Tip). I’d use a 10 weight for stripers and buy the 400 grain SASSCT for that rod. For an 8 weight, use a 300 grain instead. Technically that’s an intermediate line, not a sink tip, but it works really well for all-purpose striper fishing.